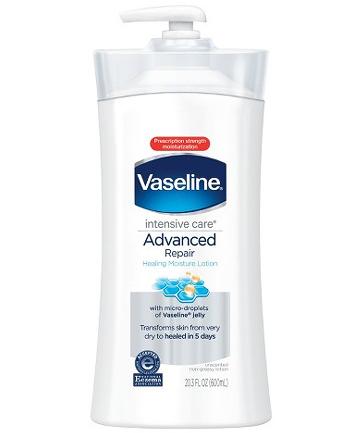 Vaseline Intensive Care Advanced Repair Unscented Lotion, $8.49 "When you get a sunburn, ultraviolet rays from the sun cause damage to your skin cells, leading to inflammation and skin barrier disruption," says Joshua Zeichner, MD, director of cosmetic and clinical research in dermatology at Mount Sinai Hospital in New York City. "The goal of treating a sunburn is to help calm the inflammation, enhance skin hydration and repair the damaged barrier." For these reasons, he recommends applying a protective seal over the skin with a light lotion that's fragrance-free, like this one from Vaseline. He also suggests avoiding heavy ointments that can trap heat from leaving the body.